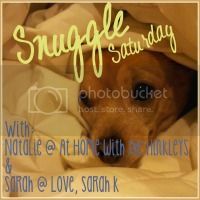 At Home with the Hinkleys: Snuggle Saturday #1 !!! Snuggle up with your computer and us and share a post, make new friends, and have an adorable dog on your page for a day! Rules are simple, follow the hosts and co-hosts for the week, and share the button on your post! Your co-hosts for next week are Andrea at Mostly Happenstance and Desirae at Going with the Flow. Be sure to check out a few other blogs who linked up and we can all be best friends together! Each week there will be a different theme or question to answer. If you could have dinner with one historical figure, who would you choose and why? This was so hard to narrow down! Of all the people I could meet, who would I pick?? I would want to meet Maria Skobtsova. Otherwise known as Mother Maria of Paris - she is my patron saint. I'd want to meet her so I could learn from her, and get schooled on how I can be a better servant of God in my own way. I chose MS as my patron saint when I joined the Orthodox church because her story resonated with me and who I am. She was a saint who was maybe less saintly to the naked eye. She liked a good beer and a cigarette from time to time, had two failed marriages and was even an athiest for a time after her father died when she was young. Kind of a beatnik in her times, she was a poet and part of literary circles and loved to discuss politics and theology and other intellectual topics. She is so someone I would hang out with today, for sure! I think a lot of people get turned off from Christianity sometimes because they aren't that girl or guy that is endlessly sweet and can quote all the bible verses off the top of their heads and seem so perfect. But Mother Maria is a saint for crying out loud AND a smoker! It gives me hope that when I feel like I am not enough to be a good example to others as a Christian, all I need to do is love - then I know I am doing it right. She had a lot of trials in her life, but it didn't keep her from following God and loving her fellow man. When she became a nun, she wasn't in a monastary, she wanted to live among the people, and spread the faith in a more proactive way. 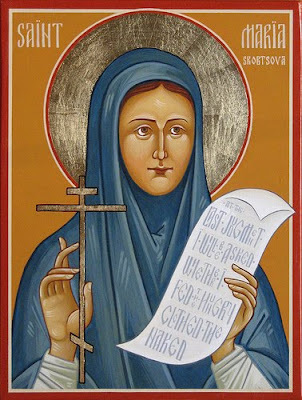 She ultimately was killed in a concentration camp, and elevated to sainthood in the Orthodox church in 2004. So I think she would have a lot to teach me, which is why I would choose to have dinner with her. Very awesome choice. How awesome would it be to meet a saint. I would have a bajillion questions for her! Ha. This is a great choice. How wonderful it would be to sit down and talk to a Saint. There would be a lot to learn for sure! That's interesting that she wasn't as perfect as we imagine saints to be. I love the picture of the pendant...very true! Great post! We would have to have you, Maria S, Mother Teresa, and I all at the Cheesecake Factory. We would really get some inspiration!!! GET EXCITED - New TV is back!! !